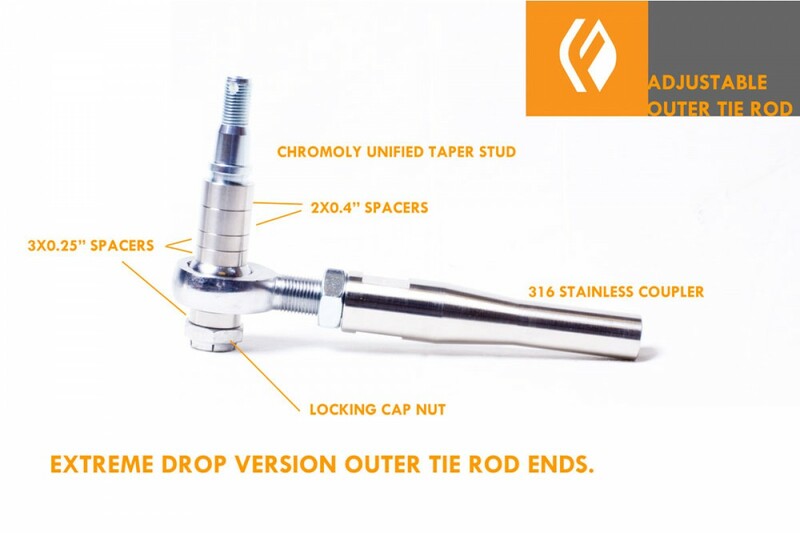 Nearly 2 Years of development yields the first round of Outer Tie Rod Ends for the GS and LS and now we make things even better with more applications supported. 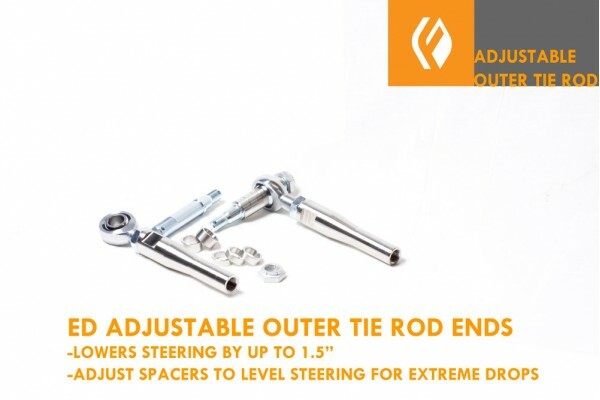 Built to last and to offer some major adjustments, these tie rod ends are a must for any lowered vehicle to correct bumpsteer and toe settings in the front steering. NOTE: since there is no indentation for stock wheel clearance, only wheels with an inner rim that will be 10-15mm( depending on spacer setting) more negative (outward) will work. 18" wheels min. are requred. GS, LS Supra and SC fitments. More to be verified. Please check with FIGS if there is a question. 4-piece Heavy Duty Precision FK rod end with PTFE liner. Chromoly Tapered stud to adapt to stock Tie rod end mount. Adjusts in length to allow arc centering. Install tapered stud into steering knuckle first. Adjust number of spacers to get steering as level as possible under load. It is strongly suggested to final mount all spacers and rod end with loctite 620 or equivalent bearing mount compound. If knocking occurs check for over travel, spacers may be hitting rod end on travel. Adjust the threads on the coupler and the rod end to have at least 5/8” of thread in the coupler, then tighten the jam nut. Set toe as you would with an OE tie rod end (rotate inner tie rod end). The Long anticipated release is here. These Urethane Bushings not only rep.. These bushings replace the inner LCA bushing #1 on the front. An eccentric version is also a.. These bushings replace the inner LCA bushing #1 on the front. This is the eccentri..
Add some positive feedback to your steering with this complete cast poly bushing set. Repla.. If your car has some mileage on it or has been lowered chances are it has torn the #1 bushing apa.. Currently, we are importing a limited number of these bars. Wait time could be a few months de..